We had the opportunity to stay for four nights at at timeshare down in Capistrano beach once again (this is our 5th year doing this). The kids had to miss three days of school, but it was so wonderful to get away together. 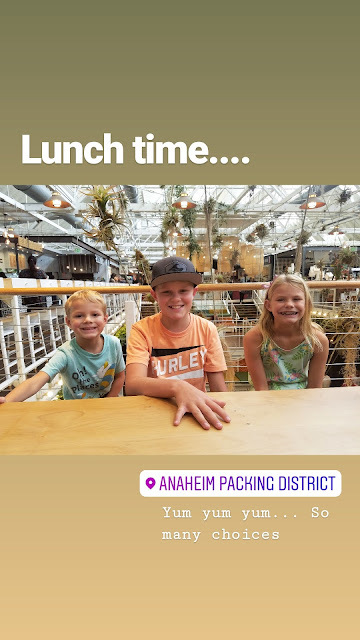 On our way down to the beach we went to a food hall in Anaheim. If you've never been to a food hall, oh my they are fun. It's like going to a mall but all they have is different places that have all different types of food/dessert/beverages. We took several laps around the place before all deciding upon different things to eat. A gorgeous sunset on our first night! We drove down to San Diego and went to the zoo. Kids are free to most things in San Diego for the month of October, so we took advantage. The only other time we have been to the zoo, Ethan was only 1 and I was 8 months pregnant with Alayna, so this was like going for the first time. They've added quite a lot since we were there 9 years ago and we really enjoyed our day. The Flores family was out here for a weekend in September, but we didn't think we were going to be able to see them. They were able to squeeze in a breakfast with us if we came out to Temecula, which of course we did. 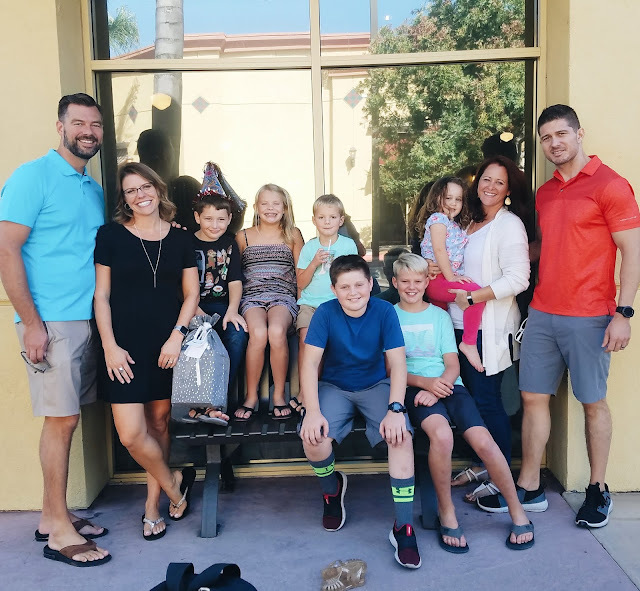 We surprised the kids, and they couldn't believe it when we walked into the restaurant and the Flores family was waiting. It was also Jonathan's birthday that day, so we got to wish him a happy birthday. We miss them so dearly, and so it was such a treat to get three hours with them! Since having kids, almost 11 years ago, I have had a double jogging stroller. If I wanted to jog, I had to take kids with me (unless I go really early in the morning). This year, with Everett in school three mornings a week I have the chance to go on runs by myself. I love going to the gym, but I've been getting in a run once a week as well. 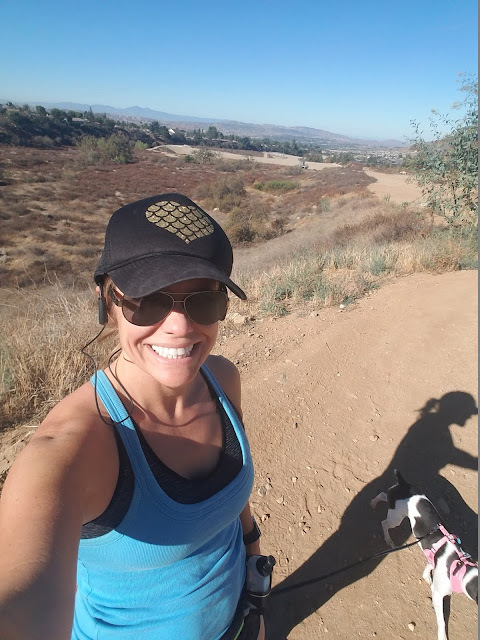 There are all kinds of trails near my house and I've enjoyed exploring them with the dog and podcasts. It's so fun to be out on a trail instead of in the street and I love being outside. It's a new season for me! 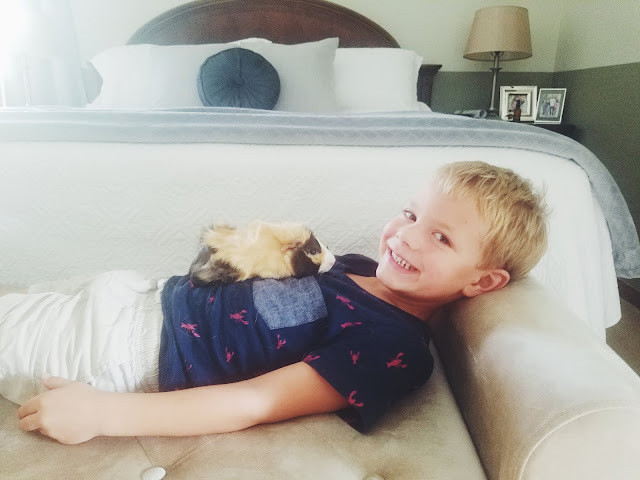 Everett has been obsessed with the guinea pigs, so I decided to get a third so they could all have one. Honestly, I walked into Petsmart to get a dog tag and walked out with him... haha. But I had been thinking about it, it wasn't totally random. The kids named him Meatball, which I think is so cute. I love all of his rosettes (crazy hair). The piggies are all getting along so far... but adding a 3rd pig to our cage means we're going to have to change it more often... yikes. The kids love their piggies! !